With no heating the guests survived low temperatures in the morning and the snow on the way home, but everyone had a great time. Very atmospheric. 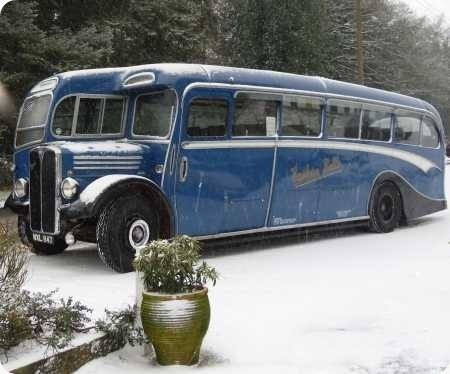 The vehicle is part of the Roger Burdett collection, and stopped in two suburbs in Birmingham as well as Lichfield to collect guests on the way to the restaurant and followed the same route back. The pictures were taken on arrival at the Spotgate Inn and just before departure back to the West Midlands. Most guests took pictures of the vehicle – the first time for nearly all of them that they had travelled on such a vehicle. My word, what a truly magnificent vehicle – that well worn word "classic" must surely apply here – and in a livery uncannily like that of Samuel Ledgard. They say that "you learn something new every day" and I believe its the first time I’ve ever seen a thirty foot long Regal or even been aware of such a variant. It must surely be one of the most handsome vehicles of the "good old days." Very impressive. It might be the camera angle, but it looks a very long vehicle! As Chris says a true classic and what a fine vehicle. It is however surprising that a half cab design was selected for such a quality heavyweight coach as late as 1953 as underfloor models had been readily available for a couple of years by then. I agree 30ft long half cab coaches were pretty rare. 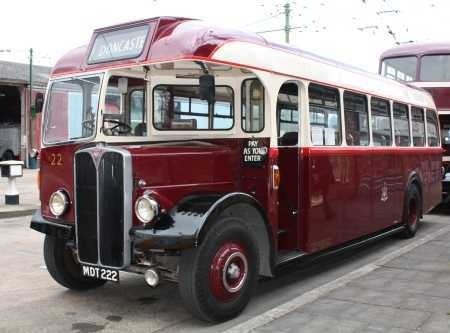 Other examples I can immediately recall were a batch of Guy Arab half cabs with Roe coach bodies bought by Lancashire United for the Tyne-Tees-Mersey service about the same time. Now you DO surprise me, Chris Y. What about the 1953 Doncaster 30′ Roe bodied Regal IIIs? (…..and I thought one of those had been preserved). The bodies are almost identical to the West Riding 30′ Roe bodied PS2s. PS2s and 9.6 Regal IIIs were rarer than PS1s and "7.7" as were 30′ rarer that 27’6" – but there were still appreciable numbers. Crossley produced 54 30-foot long chassis. However, nearly all of the received full-front bodies, with only eight being of the traditional half-cab layout. Coach design was in an experimental phase at this time, as ten for the USAF had raised rear saloons and a further three were half-deckers. Yes, David – I’d also thought of the Doncaster 30ft Regals. However, in defence of Chris Y, they had a straight-sided profile with deep windows which didn’t emphasise the length. However, this beautiful Eastern Belle example looks like a 27’6 version stretched to 30′. Indeed, I now see that EFE made a model of this coach, but using their 27’6" mould with six side windows instead of the Eastern Belle’s seven. I wonder if, in 1953, the Duple staff had to delve into the back of the stores to find the patterns and templates for this late example from a different era. A rash question to our knowledgeable readers, but was this the last curved-sided half-cab ever made? Here an example of a Lancashire United Guy Philip alluded to. The Roe body is not dramatically different from the Duple style. They were built in 1950.
https://secure.flickr.com/ For some reason the page does not display correctly in IE you will have to scroll down to find the picture all other browsers work fine. Barton Transport had a Duple A coach body which they lengthened themselves to a 30ft 39 seater as part of their BTS1 re-building programme, I think it was the only only one which retained a half cab body. No doubt they had lots of spare body parts from all their alterations but perhaps it wasn’t as easy as may be thought, I imagine it would have involved altering the body pillars to correspond with the increased wheelbase but the side window pattern on the finished product was exactly the same as on the one above. Don’t forget the possibly largest batch (?) 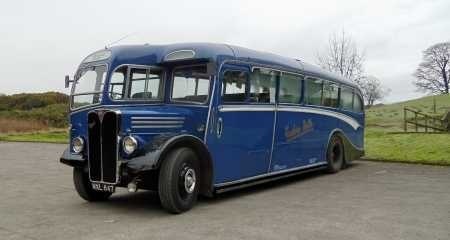 of 30 foot half cab coaches, Royal Blue’s 1951 Bristol LL6B/Duple C37F, 24 in number. In my last post, I forgot about the further 14 Bristol LL6B/Duple C37F which Southern/Western National acquired in 1951 for their own fleets. Again though the Royal Blue Ls were 8ft. ……..and nothing as late as 1953. Unless someone knows different? David O. mentions the three Roe-bodied 30′ Regal III’s for Doncaster. 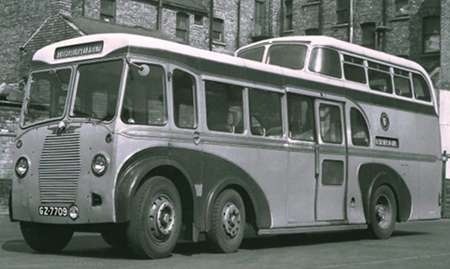 According to the PSV Circle’s chassis list for the type, the previous three chassis numbers to these were three seemingly identical Roe-bodied buses supplied to the Belfast Steamship Co. of Liverpool. I have never otherwise heard anything else about these buses, or ever seen photographs of them. Does anyone have any information about these totally overlooked machines? The list shows around 50 Regals with seating capacities of 37 or over, so which were probably of the longer length – surprisingly AEC did not give them a different chassis code. 12 Roe-bodied buses for West Riding. 6 Roe-bodied coaches for West Riding (with the similar bodies to the LUT Arabs). 14 East Lancs-bodied buses for Burnley, Colne and Nelson. 1 Burlingham-bodied coach for Wilkinson’s, Sedgefield. 1 Burlingham-bodied coach for Harding’s, Birkenhead. 1 Heaver-bodied coach for City Coach Co.
2 Observation Coaches for U.T.A. bodied by themselves. The City Coach and U.T.A. examples were six-wheelers with a temporary additional lightweight front axle, to legitimise their 30′ length prior to the relaxation in the length limit. They were designed to be removed when this came into force. C H Roe (Geoff Lumb) p82 shows a Belfast Battle, sorry, Steamship bus – of 1954. These are quoted as being the same as the 1953 Doncaster examples. I believe that there were earlier 27’6" examples before and also Regal IVs. This Eastern Belle coach (NXL 847) was the company’s second similar vehicle. In 1951, they had taken MLC 343, a photo of which is included in Eric Ogden’s ‘Duple’ book. Were the Royal Blues 8 feet wide? The LL chassis was the 7ft 6in version, the 8ft option being the LWL. Southern/Western National introduced white steering wheels to denote 8 feet wide vehicles; the photos I’ve seen of the Royal Blue LL6B coaches have the traditional black steering wheels. There were more than the 108 30 foot PS2 Tigers listed by John Stringer. In the PSV Circle Leyland PS2 chassis list, as well as those 108, 44 of the PS2/3 are quoted as 30 feet long, with the note that ‘there may be others’. It seems that early production 30 footers were conversions from the shorter models (Doug Jack’s ‘The Leyland Bus’). My Duple L LTA 898 has a white steering wheel and whilst I would not stake my life savings on it I think is 8ft. I rather think white steering wheels to remind drivers that the vehicle was 8ft wide was standard Bristol practice. Two of the contributors to this thread mentioned the Regal IIIs supplied to Doncaster Corporation. I’m happy to attach a photo of number 22, taken at it’s home at Sandtoft Transport centre. What great pictures, Andrew, of a superb and beautifully preserved vehicle. 22 is just fabulous, and shows how well Doncaster’s livery could look when clean and fresh, which, at the risk of offending anyone, I have to say it often wasn’t. The use of front-engined vehicles for one-man operation was, I think, quite rare. It must have required some twisting and turning for the driver. As Roy rightly says, the use of front engined vehicles for one person operation was comparatively rare, but certainly not rare enough. The degree of contortion necessary for the driver at every stop was totally unacceptable and must have been the cause of spinal and inner organ damage. Much scoffing is aimed these days at "Health & Safety" which can admittedly sometimes be over the top, but in this particular instance it should have been applied with full force to prevent this ludicrous practice. I should juts clarify that I’m referring to front engined vehicles of the traditional layout – a modern exception of course being the wonderful, in my humble view and from experience, Ailsa Volvo double decker – a vehicle whose incredibly skilful design allowed a front engine, adequate passenger flow on the platform, comfortable room for the driver, and 79 seated passengers conveyed reasonably speedily by a 6.7 litre engine. I’ve always had the feeling that the sales figures of the Ailsa were mortally wounded by the unreasonable fear of the layout which the ill fated Guy Wulfrunian left as its legacy. Am I correct in thinking that an operator called Homeland Tours bought a number of 30ft Leyland Comets? I’m sure I’ve seen a picture somewhere, I would imagine they really were unique! Re Chris’s comments about the Ailsa, I don’t think anyone would make comparisons with the Wulfrunian because it was well documented that the problems there were caused by Guy overreaching itself with advanced braking and suspension systems. What operators probably were fearful of was the small turbocharged engine, an idea which was virtually unknown in Britain then. In other words, a bus ahead of its time. There were some outstanding bus liveries around and one nomination I would give is to West Bromwich Corporation, witness the preserved Daimler CVG6-30 seen HERE: https://secure.flickr.com Pity that, whenever I caught glimpses of them lurking around in Brum, they were always as tatty as Hell! It didn’t help that B’ham Corp’n generally kept their vehicles impeccable. Homeland Tours was an operator based in Croydon during the post war years who had a number of Leyland Comets with Strachans C37F bodies. As a schoolboy in the Croydon area in the 1950s, I used to see these coaches about frequently. I believe that these vehicles were actually owned and operated by Wallace Arnold to whom Homeland had "passed" the licences and goodwill. Homeland Tours still exists as a travel agent in Croydon. 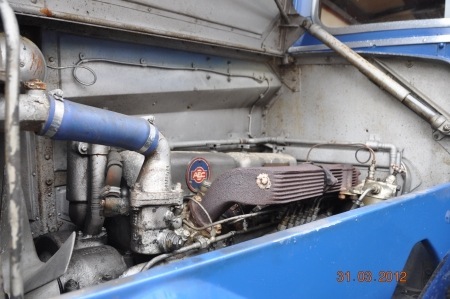 Regarding the Ailsa Peter, the engine theory is an interesting one which I hadn’t thought of. In the event though, any concerns about the performance and longevity of those tiny Volvo engines have proved to be unfounded, and the performance of their immediate successors leaves me full of admiration. For example, the speed at which the Volvo B7TLs ascend Royal Park Road (very steep) on the 56 service in Leeds with around ninety passengers, while confidently changing gear upwards, is nothing short of amazing – those long in the tooth like me recall the 7.7 litre Mark V AEC Regents whistling, wheezing and protesting at little more than walking pace when heavily loaded. Thanks, Chris H for the link to the West Bromwich Daimler. A very smart vehicle indeed. It made me think about other liveries, and I wondered what other correspondents’ favourites might be. East Yorkshire’s indigo and primrose has its fans, and from my own neck of the woods, York Pullman was always both smart and attractive, (and it still exists). Any nominations? Sheffields smart cream and blue always smartly turned out was a favourite The many variations in the late lamented Black Prince livery again always smart Pennine Motors unusual orange and black The LCT one man livery was always smart though often dirty Others will no doubt have their own choices. One other to mention is the Leeds blue and cream pre-war livery on both buses and trams examples of which happily survive. Indeed many of us have our favourite "traditional" liveries, and with good cause, when we have to live with some of today’s ghastly and inappropriate offering, most of which make me despair as to where the Industry is going. I just wish the "marketing" fraternity would stick to promoting baked beans etc. and that operators would cease wasting so much money on garish and incomprehensible horrors which the travelling public are probably unaware of and totally disinterested in. Rant over, but not for long, as I feel so strongly about this issue that I can rarely get it out of my mind. Now then, another favourite livery or two of mine – Southend Corporation’s beautiful light blue and rich cream, especially when they spent their money wisely against the 1960s trend by increasing the number of places on the intermediate destination blinds from three to six – the expression "getting your priorities right" springs to mind. 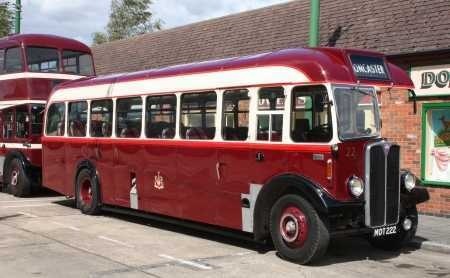 How about the most dignified Accrington Corporation dark navy and red – different and sombre, yes, but most impressive. Yes Chris, Accrington’s was indeed a most dignified and distinctive livery. I once read in a book somewhere that it was first applied after World War I, as a mark of respect to the many Accrington Pals killed in action. Their regimental colours were red and blue with gold lining. It is also said that the mudguards of the buses were painted black at the same time, as a sign of mourning. However, other operators also had buses with black mudguards over the years, so I’m not quite so sure about the latter. A very touching tribute nonetheless though, to such brave men. I agree with Chris Youhill’s hatred of modern corporate colour schemes (I hesitate to grace them with the title "liveries"). My particular dislike is having windows plastered with stupid advertising tosh. WINDOWS ARE FOR LOOKING OUT OF! If they want to cover them over they may as well save on glass and just panel the sides in altogether (as they have the rear of many vehicles). I’m waiting for Chris Y to vote for South Yorkshire Motors, (from West Yorkshire) whose Oxford/Cambridge blue was very handsome & well maintained despite the age of some of the vehicles. As someone said, Doncaster’s Crimson Lake was potentially good, but attacked by filthy roads around collieries until it went a sort of dark maroon. Doncaster’s old livery never had any names- just the coat of arms. The old umbery East Midlands had a mention here- but it was dropped for the ultimate in boring. Perhaps the most horrific "new" livery was South Yorkshire Transport’s (not to be confused) Yuk yellow & red, with some dreadful graphics. What a far cry…. The Accrington livery up to the late sixties also included black window surrounds on the lower saloon, which I always think set it off. This may be the black that was referred to rather than the wings. As many will know Joe, I spent my last fourteen years with South Yorkshire Road Transport (and several successors) at Pontefract Depot. The vehicles were indeed well maintained and smart, inside and out, and I can’t imagine many private firms employing a team of four daytime lady cleaners Monday to Friday to keep the interiors of around twenty vehicles in pristine order. These splendid ladies left no stone unturned and could often be seen on their knees washing with difficulty the seat support rails and other areas usually unknown to the average cleaner elsewhere. There honestly were amusing occasions when a vehicle had to be rapidly collected from the depot for an unexpected changeover – I have personally experienced leaping into a cab and setting off promptly for the bus station to hear an anguished cry from up aloft – "Just a minute luv", and two of the worthy ladies would come downstairs with buckets and mops and alight just in time to avoid being whisked away to Doncaster or Barnsley !! The original South Yorkshire Motors livery of two blues and rich cream with traditional fleetname was indeed a classic one. When the Company was reconstituted (still under family ownership) as South Yorkshire Road Transport Limited the livery gave way to the familiar modern one of two blues and stark white ir-rational (to me) rectangular shapes, and bold white large fleetnames. Rumour has it that the white shape of the lower forward panel was to emphasise the presence of the front wheels which I suppose had some merit – but I have to say that I found the new livery to be a retrograde step and I didn’t particularly like its layout and the stark white. Here Here Chris re. modern liveries! Absolutely awful. You mention the superb Southend pale blue and cream, laid out in traditional fashion. It was enough to inspire Bradford to change in 1942 when they borrowed some Southend trolleys. 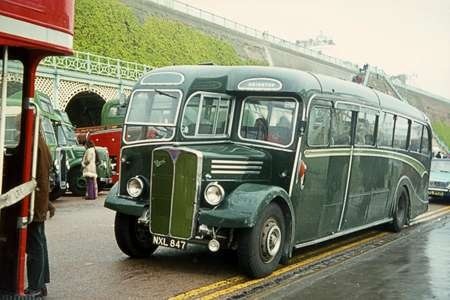 I think the best traditional liveries were those employed by the Tilling Group, but perhaps my own personal all-time favourite was the deep green with cream stripes of that wonderful AEC fleet, Morecambe and Heysham Corporation, which showed off the lines of classic Park Royal and Weymann bodywork with real flair. I recall the attractive M & H livery on one visit there, with typical ‘tramway’ lettering and fleet numbers. The buses had no route numbers/letters. I had the chance to ride on this excellent coach again today and got a picture of the engine. I do hope it is of interest to you. 600 mile round trip to take Eastern Belle to Belfast with 20 passengers-must be one of the longest trips for a half-cab in 2012 and it ran perfectly. Whilst (laboriously) digitising my slide collection I came across this view of NXL 847 – then in a two-tone green livery – as it prepared to depart from the HCVC Brighton Rally in 1973. 1973 was the year I graduated from University and NXL 847 "Eastern Belle" belonged to Waltham Forest Council Welfare Services at the time. Having been born in Bow, East London I remember Eastern Belle Coaches very well. In the fifties our street would book a coach with eastern belle to take us to see the Southend Lights. I also remember their garage being a very crampt premises on the Bow Road. I took my first car there for an MOT in the early sixties and remember seeing two redundant dust covered AECs wallowing in the corner. I am now 70 years old but never forget these lovely well kept vehicles. Re the comment posted by John Stringer (16/03/12) regarding, the two "observation coaches" built on PS2 chassis by the UTA they were eventually rebuilt (along with many other PS2’s) into PD2/10C deckers with UTA 60 seat bodies. Curiously both survive in this format – one is preserved and the other is a former playbus. I see this old thread has risen again, thanks to a wonderful view from Bill Headley. Thank you for posting! I note the exchanges of thought about the Ailsa. I’m not sure if the claim is still made (if it ever was!) but I seem to remember the Volvo cars were designed for a 22 year life. No wonder their bus engines performed as healthily as CY reports! Not true of the B6 engine, Pete. The B6 was a dreadful attempt at a Dart clone, and a complete abomination.